A public hearing is set for 6 p.m. Tuesday, Oct. 23 at Metro headquarters. An online survey is also available through 9 a.m. the following Monday. 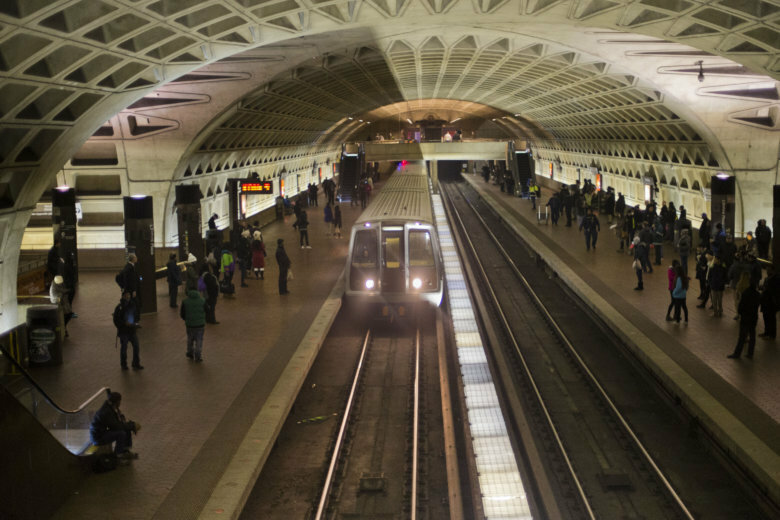 WASHINGTON — Metro riders and others can now weigh in on plans that could end free parking on weekends and holidays — and raise fares on days there are large events like presidential inaugurations, championship parades or massive protests. A public hearing is set for 6 p.m. Tuesday, Oct. 23 at Metro headquarters. An online survey is also available through 9 a.m. the following Monday. Any changes could take effect in January. The fare increase would be implemented when Metro runs a significant number of additional trains for large regional events. Under the proposal, Metro would charge rush-hour fares on days it plans to run rush-hour service. With current fares, that would mean an increase for the shortest trips from $2 to $2.25, and for the longest trips from $3.85 to $6. The increases would offset the costs of running the extra service, Metro said, and could be implemented for only part of a day when crowds and additional service compared to a typical day are focused in a particular time, like the evening of July Fourth fireworks. Metro plans to continue charging for parking on Saturdays, and potentially other weekend days and holidays, and continue charging parking fees starting earlier on weekdays in order to charge people who illicitly use the garages overnight. While analysis on parking changes under a series of programs rolled out in February and now due to expire at the end of the year has not been released, leaving the effectiveness of many of the changes unclear, Metro said 38,312 transactions were recorded from February through May at Metro lots during the two additional hours parking fees were charged on weekdays. The proposal now under consideration would begin charging even earlier, starting when Metro stations open. On weekends and holidays, Metro would charge up to weekday parking fees, an increase over the $2 Saturday parking fee that has been charged since February. This year is the first time Metro has charged for weekend parking. Northern Virginia officials have already expressed concerns about that change, due to fears adding extra fees could turn off even more riders. The Montgomery County Council has expressed separate concerns over rider input is being ignored, asking the Metro Board to reverse course on an expected final vote next week to dissolve the Riders’ Advisory Council. That would include events from July Fourth to a Papal visit or the Cherry Blossom Festival, and anything else identified by the general manager. It would match days where Metro charges peak fares under the separate fare change proposal. The idea would be to raise more money for the system, and the extra parking fees would apply whether or not Metro runs any extra trains. In addition, Metro wants to expand non-rider parking fees for special events to all stations, begin accepting mobile apps like SpotHero or ParkMobile for parking payment and make changes to the limited number of spaces where multiday parking is allowed in Metro lots. The special event non-rider fees would mirror the additional parking fees charged at Largo Town Center and Morgan Boulevard during events at FedEx Field and College Park during football games at the University of Maryland. The fee up to $25 would be applied when there is some type of festival, circus or other event near a particular Metro station, and only to people who did not pay using a SmarTrip card that had recently been used to ride a train or bus. Mobile app payment could also be coupled with license-plate recognition technologies or new pay stations. Like local parking meters that use the systems, people paying with the new technology would be charged an additional convenience fee. Multiday parking is currently only technically allowed at Franconia-Springfield, Greenbelt and Huntington for up to 10 days. The changes would allow multiday parking at more stations and increase the fees significantly. Today, the fee is only charged for the final day. The changes would increase that to the regular daily charge for each day plus one-day’s worth of any additional fees charged to people who do not pay for their parking with a SmarTrip card just used to ride the Metro system. Metro has dropped a plan to lower parking fees at lots that have the largest proportion of empty spaces in an effort to draw more riders.